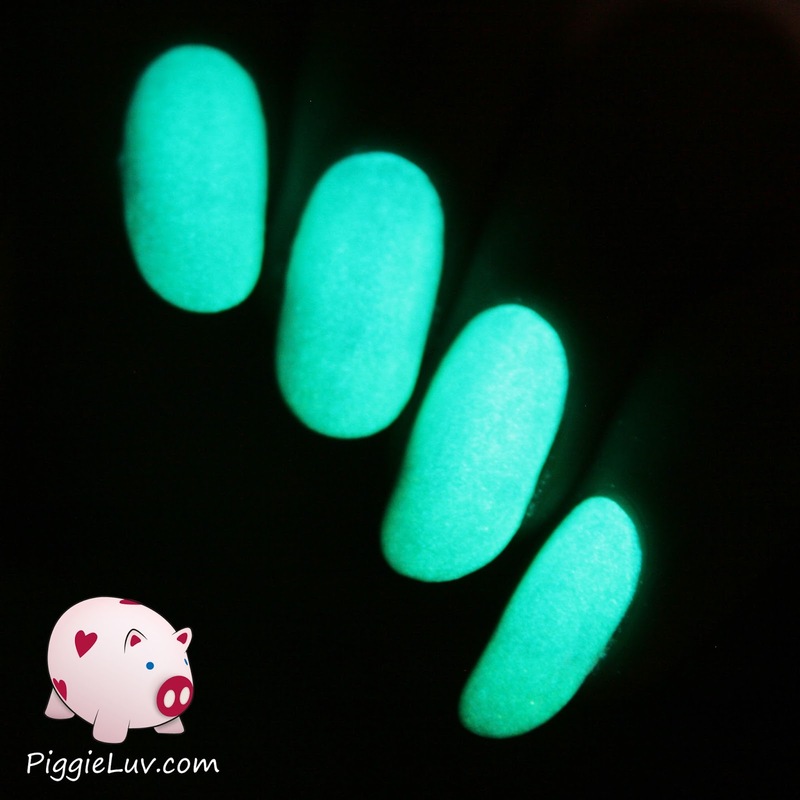 PiggieLuv: 5 tips for taking glow in the dark nail photos! Heyyaa ladies! 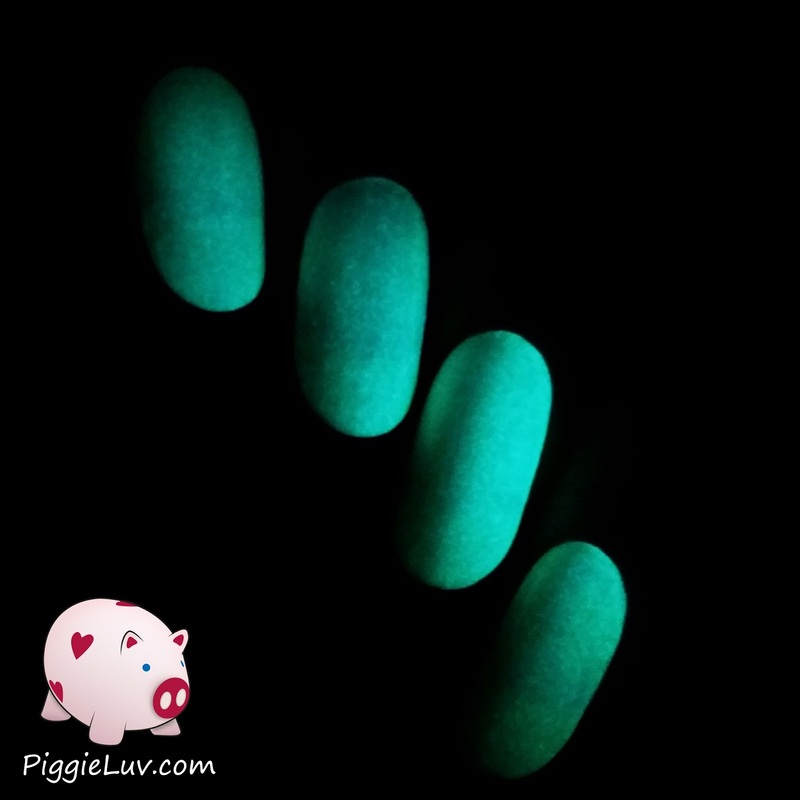 I've been getting a lot of questions about how I photograph my glow in the dark nail art, because it takes a few tricks to get a good shot. So I'm gonna explain everything I know to you! Let's get this party started! I know I went on and on about this in my previous nail photography tutorial already, but it's such an important part of taking good nail pictures. Where most cameras will do fine in bright lights, it's a whole other story when the lights go out (ooohhh!). Now we're talking about capturing a tiny spark of light in the darkness, and not all cameras will be able to do this. If you have a little compact camera, usually it will have a setting for 'low lighting'. This doesn't match the possibilities you have with manual settings, but it will get you further than the regular settings. And phones these days can't be ignored either!! I have a severely unhealthy relationship with my phone, in that it is with me all day (and all night) and I like to take shots of everything I see. I want a good camera on it. No, I NEED a good camera! I went for the Samsung Galaxy S5 and this phone has magical powers... it reacts to voice commands, like a dog! I took this glow picture while holding my phone and a UV light in one hand. It was a bit of an awkward position, and I couldn't reach the shutter button. No problem! I just went: "Focus. Focus. Smile!" and it clicked! Haha! I set the ISO value to a max. of 800 on my phone, and there's a lighting bar that I can shift to +2.0 to light up my picture. VERY convenient! 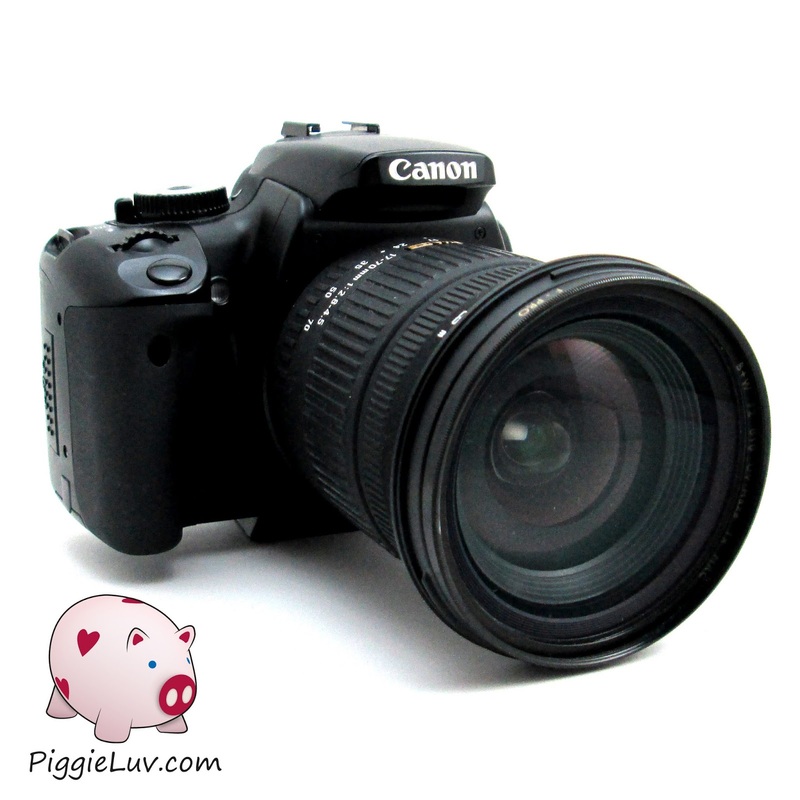 The ISO value determines the sensitivity of your camera to light. A lower ISO value means a darker picture (unless you compensate for it by adding lighting, or by setting your aperture and shutter speed). A higher ISO value will make your photos brighter, but a really high value will also make them more grainy! Be careful when using this in normal lighting pictures, it definitely doesn't make your photos prettier! My camera goes all the way up to ISO 1600, which isn't a lot so I don't see the difference all that much. The graininess isn't bothersome in glow in the dark pictures, so don't be afraid to jack it up because it will make it easier on the other settings. The aperture is the number that indicates how big or small your camera's diaphragm is opened. A high number (what we call f-stops) means the diaphragm is small, so hardly any light will come through. You can imagine this being beneficial when photographing something really bright like a sunset. But we want a low f-stop, meaning our camera's diaphragm is way open and letting lots of light come through. I always set mine to the lowest f-stop possible (with my lens zoomed in all the way, that's f4.5) and leave it there, while I go play with the shutter speed. The shutter speed is the time in which your camera's sensor is exposed to light. This is a lot of fun to play with, but also kind of annoying. 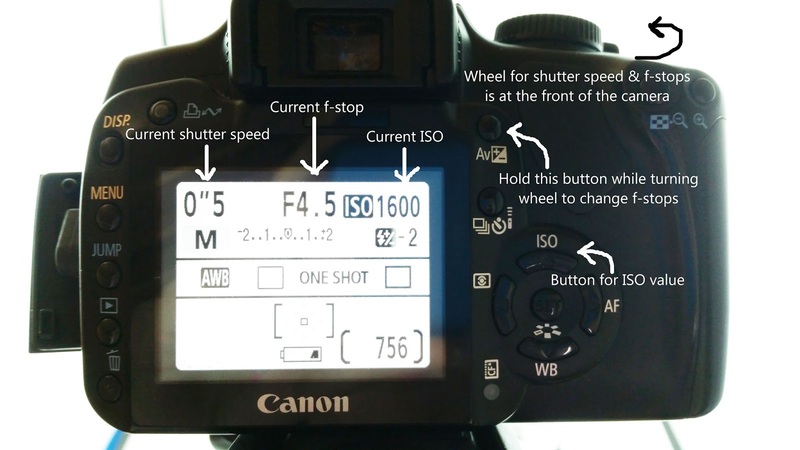 See, the longer your shutter speed, the longer your sensor will pick up images. So if you move, that'll be transferred into the image as blur. You'll want a fast shutter speed for clear, crisp photos but this means less light, so you might not capture your pretty glow polish. Ohhh what to do? 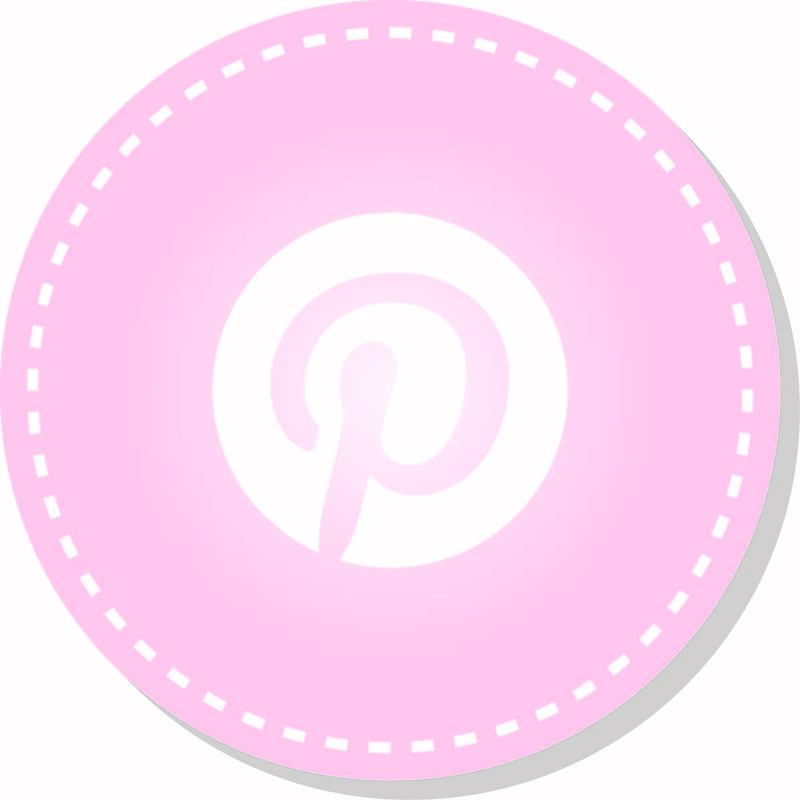 There's a few tricks, so read on! I'm using Serum No. 5 Glowin' Of Eden for my model today, so for this example, I had to use a lower ISO value because this polish is SO freaking bright! Obviously the first picture is too dark, because the shutter closed too soon, thus not letting in enough light. The middle picture uses a longer shutter speed and is closer to what you see in reality, but it's still a little bit dark. It's important to keep looking past your camera every once in a while, and take a glance at the polish itself, so you will get an accurate picture of what it looks like. Not all polishes glow equally bright. The third picture is a bit too bright in my opinion. The shutter speed I used isn't far from what the second picture was taken with, but even though this polish is bright, the third example is not what it looks like in real life. You don't want this result for glow nail art pictures either because if you have a nice black silhouette on it or something, this brightness will wash out your outlines. 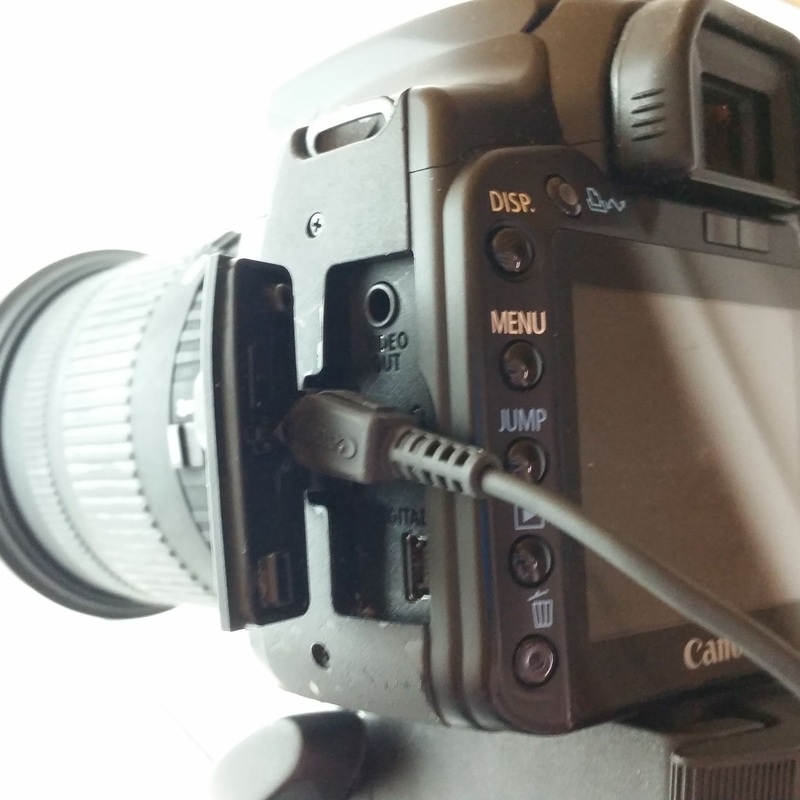 Use a tripod or a hard, flat surface to rest your camera on. If it won't move while taking a photo, that's already half your blur solved right there. Try to rest your hand on something while taking your picture. And what helps me is exhaling and holding my breath while my camera is taking the picture. 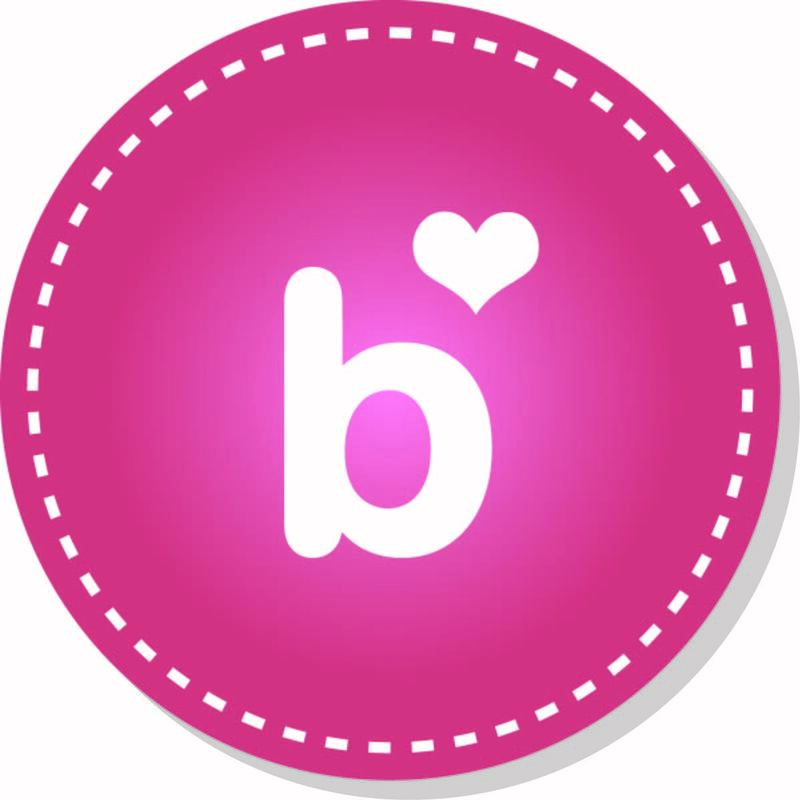 It's a game of sacrifice, this blogging we do! Haha! This is how I roll! My light box is situated in kind of a crawl space. I can't walk upright in it, but I'm also not bumping my head every second and I can sit on a low stool comfortably. Though most of the time, I'll just kneel. The space has the advantage of being super dark, I have these sliding doors that close all the way and no light gets through. I'll explain what the heck I'm doing with my left hand! Read on! Having a shutter button means I don't have to touch the camera at all while I'm taking a picture, so that minimizes my motion blur even further when I'm forced to use a slow shutter speed. It's a really cheap accessory photography wise, I bought mine for €10 in a local store. Having one also means I can take on different hand poses that wouldn't be possible if I still had to reach the camera, and it also gives me the ability to use my left hand for other things at the same time, like holding a UV light. The BEST trick you'll learn today is one that you can utilize outside of nail photography as well. 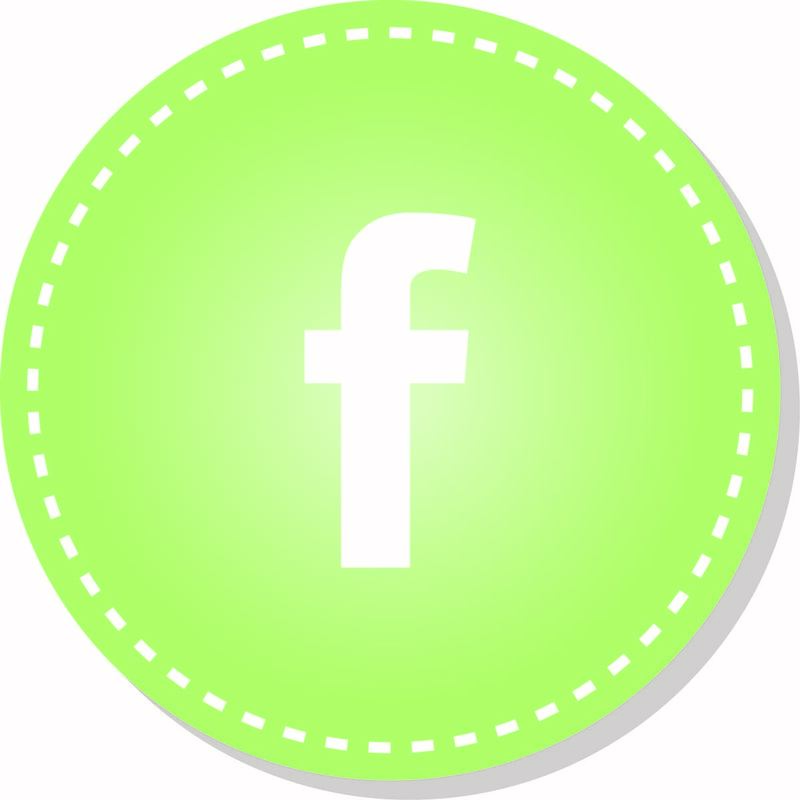 It works for any glow in the dark object: UV light! I bought a simple UV flashlight on eBay, it was about $2 and I have one in my purse, in my nightstand and next to my lightbox. The daylight bulbs I use in my light box emit UV-B light because I bought cheapos at a pet store, and they charge my glow polishes really well, but not as awesome-sauce as my flashlights. 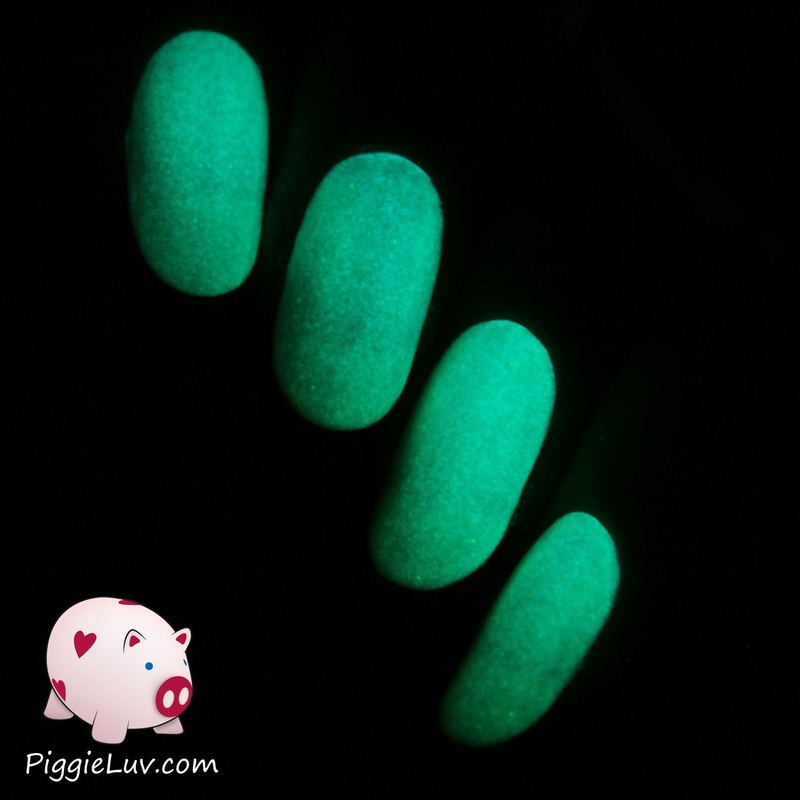 If you have a UV lamp for gel nails, that will probably work too! 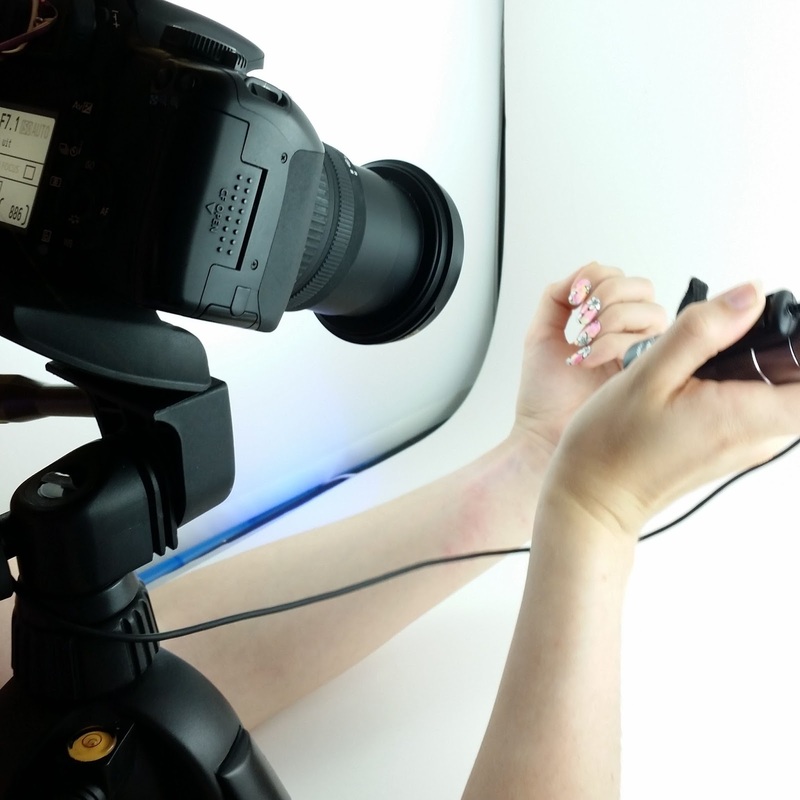 I hold my UV light and my shutter button in one hand (because I'm using the other hand as my model, duhhh). 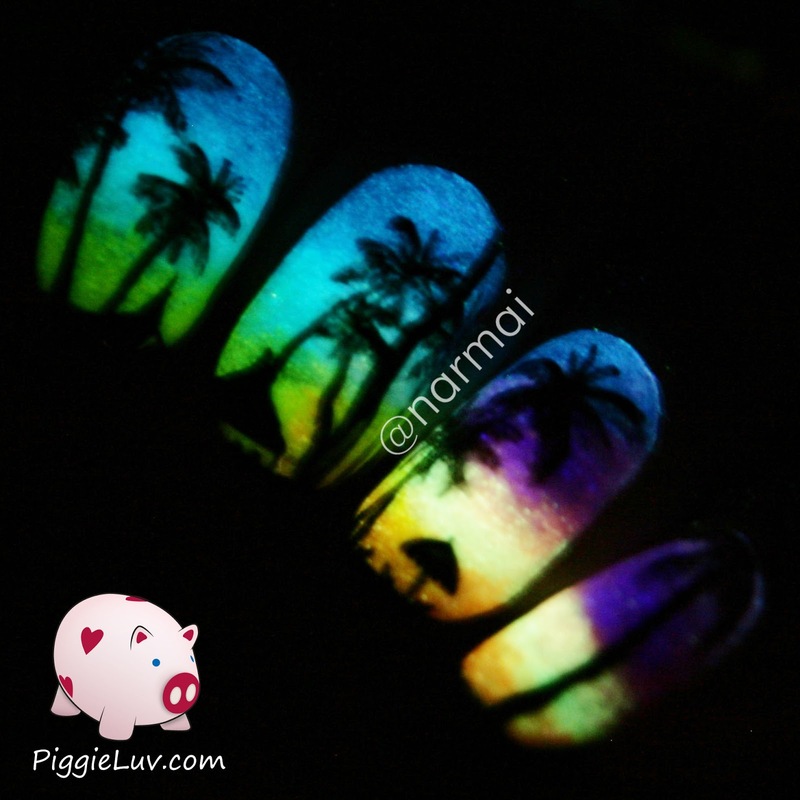 It takes some practice but while I'm pointing my UV light at my nails, I can easily press the shutter button to focus on the nails (the camera has a freaking hard time focusing in the dark) and this gives me a clear picture. 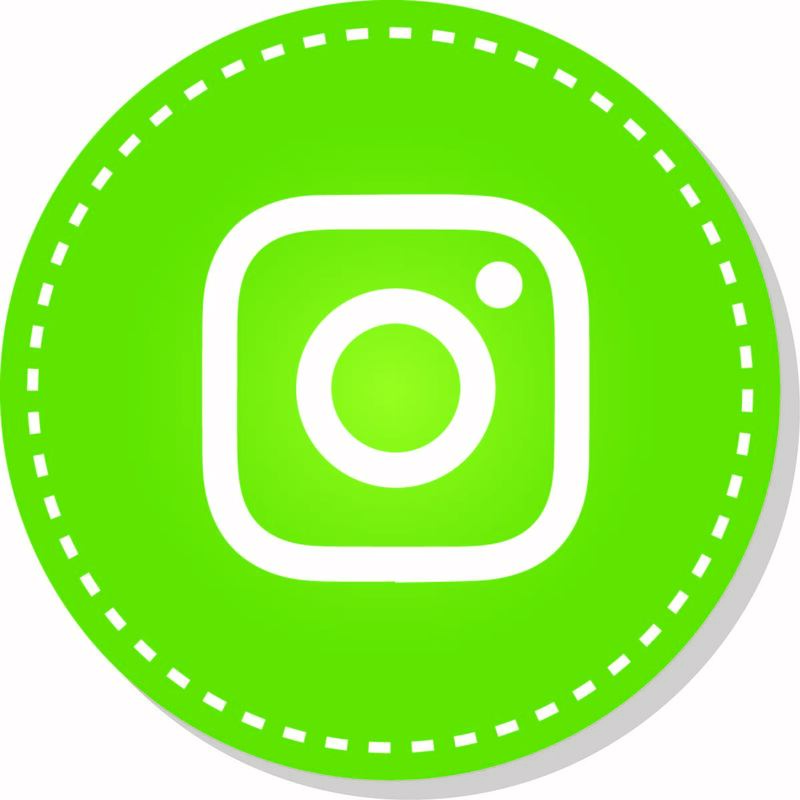 Keep holding the shutter with your finger on the back of the light where the power button is, press that lightly to make the light go out and immediately click the shutter button to make your camera go "click!". It's quite an ordeal but ahhhh the pictures it brings us! Magnificent! When I do this right, I don't have to take a gazillion glow pics because 5 or so will be enough. There's bound to be a clear one in the bunch. And when I click the shutter button before turning off the UV light, this is what that looks like! Okay, that's it for today kids! Feel free to check out my tutorial on 'normal' nail photography and ofcourse if you have any questions, ask away!